Trinamool' Dola Sen refused to abide by security protocols, delaying Air India flight by 40 minutes. A day after MPs were warned that on airlines, they are passengers like everybody else and cannot jeopardize safety, a parliamentarian from Mamata Banerjee's Trinamool Congress delayed a flight by nearly 40 minutes because she was not given the exit row seat she had booked and paid for, after which she "shouted and screamed" at the cabin crew. Dola Sen was flying Air India from Delhi to Kolkata. The airline says because Ms Sen was traveling with her mother, who was in a wheelchair, she could not be seated in the emergency exit row, which offers more leg room, but must, according to rules, be used by passengers who are physically fit and can help the crew, if needed. The airline said the MP didn't mention that she would be accompanied by someone in a wheelchair when she booked her tickets, which is why she was sold the seats in the row she requested. "The passenger had not informed us about the passenger on wheel chair and only on boarding, we realised this. So the airline crew objected politely", said an Air India official to NDTV. As Ms Sen launched into a lengthy tirade, her mother was offered a business class seat, which she refused. "Realising that the flight was delayed due to the ruckus and the passenger was an MP, the pilot came out of the cockpit and used his discretion to allow the passenger in the wheelchair to continue on the allocated seat," said the Air India official. By this time, the flight was 39 minutes late. When the plane landed, Ms Sen ,reportedly still unmoored from calm, asked airline staff to collect the signatures of all her co-passengers to state that it was not she who led to the flight being delayed. Today's outburst took place within hours of Air India being ordered by the government to end a two-week-old ban on Ravindra Gaikwad, a Shiv Sena MP, who assaulted a 60-year-old manager working with the carrier. The Civil Aviation Ministry said that it had accepted a letter sent by Mr Gaikwad in which he offered his "regrets for the unfortunate incident." He made it clear yesterday that he will not apologize to the Air India manager, who, he says, provoked the assault by mocking and shoving him. Though his party insists that it has video evidence of this claim, it has not shared the footage so far. The Sena threatened - its signature move - to prevent flights from taking off from Bombay if the ban were not ended. MPs from other parties said that airlines should not be allowed to ban them, bolstering the Sena's stand. Earlier this week, a parliamentarian from the BJP said that private airlines bully passengers; his assessment was based on his own experience which, he said, forced him to travel by train. 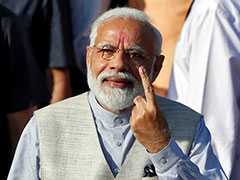 "I had booked a ticket with Jet Airways more than a month ago but when I reached the airport on last Friday after the house was adjourned, I was informed by one of the officials that my ticket has been cancelled and allotted to some other passenger," said Devji Patel, who is an MP from Rajasthan. "Private airlines are bullying their passengers and even we are victim of it. It always happens with MPs. This must be stopped," he said. He was supported by over a dozen BJP members. Earlier today, a union of Air India cabin crew said that passengers must be made to observe norms of safety and "public behaviour" -a comment aimed at the Shiv Sena leader who they will have to fly again.